The UK squad controlled the first half of this Group E contest, but was outscored 21-8 in the third quarter and couldn’t make up the deficient giving the Czech Republic the victory. Karel Ausprunk contributed 17 points and Radovan Kouril added 16 for the winners. Nelson Luke paced the UK with 17 in the loss. Estonia dropped to 0-3 with a 26-point loss to Israel. Egor Koulechov’s 20 points paced Israel, while Martin Jurtom scored 10 for Estonia. Finland earned a trip to the final four in Group B with an 86-74 victory over Belgium. The Fins found themselves behind by three at the intermission, but set up a match-up with the Czech Republic in the semifinals when they outscored the Belgians 24-14 in the third stanza and held on through the end. Lehtoranta Joonas led Finland with 27 points and was assisted by Julius Rajala’s 22 points and 12 rebounds. Belgium was paced by Emmanuel Lecomte’s 21 points. Host squad Bosnia and Herzegovia earned a spot in the semifinals against the United Kingdom with a 82-72 win over Montenegro. Bosnia led the contest from start to finish on 27 and 21 point performances by Adin Vrabac and Buza Nedim, respectfully. Milija Mikovic led the losers with 16 points and Nikola Zizic contributed 14. Austria’s two-point victory over Hungary to win Group G of the Classification Round for 9th to 16th Place. The squads traded the lead throughout the game with Austria leading after the first quarter and Hungary holding an advantage at the half and a four-point margin at the end of the third quarter. Austria got 20 points, including key late game baskets and free throws, and 17 rebounds from Jakob Poeltl to pace the victors. Perl Zoltan and Gyorgy Goloman paced the losing effort for Hungary with 22 and 15 points, respectively. Slovakia and Romania entered this contest without a win between them in the tournament. 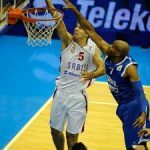 Slovakia was down by 10 points with nine minutes to play and outscored the Romanians 28-9 to earn the nine-point victory. Brodziansky Vladimir scored 15 points and 16 rebounds, and Nemcok Vladimir Michalek contributed 14 in the win. Matejcik Marting dropped in 13 and Vladimir Michalek scored 11 for Romania. Portugal improved their Group H record to 3-0 with an overtime victory over Iceland. The first quarter ended with Iceland up by six, and the half ended with Portugal up by one at the half. The contest moved into an extra stanza when Iceland’s Sigurdarson Matthias dropped a three-pointer at the buzzer, but Portugal won the OT slot 8-6. Gallina Joao paced Portugal with 17 points and Mattias led all scorers with 20 points in the losing effort. Holland moved their record to 2-1 with a hard-fought victory over Swenden. Jito Kok scored 15 points for the winners, while Maarten Bouwknecht contributed 14 to the win. Alexander Gorski paced Swenden and led all scorers with 25. Belarus won Group I with a two-point victory over Luxembourg. Belarus was up by one-point at the half and built a 66-62 advantage after three quarters. In the fourth, the squads exchanged the led numerous times, but Hoeser Jo tied the score for Luxembourgh late in the game, but Anton Vashkevich sealed the victory for Belarus. Patupchyk Yahor and Vashkevich led the winners with 16 points each. Jo had a monster game coming up with 36 points in the losing effort and Thomas Grun contributed 18. Georgia controlled the Scandinavians throughout the contest and improved their record to 2-0. Beka Burjanadze led the winners with 23 points and 14 rebounds, and Ramishvili Nika added 17 and Giorgi Tsirekidze contributed 16. 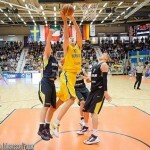 Fjaerestad Espen led the Norwegians with 14 points. Finland Aug. 18 Czech R.